Do you eat out a lot or even on occasion? Did you know you could be earning Southwest points toward FREE travel on the airline just by signing up for their Rapid Rewards Dining program? It’s an incredibly easy and FREE (my two favorite things!) — in fact, it requires no work after you sign up — way to earn Southwest Rapid Rewards points, which are the currency for Southwest’s loyalty program. All you have to do is sign up for the program using your Southwest Rapid Rewards number and then register ANY credit card that you might use to pay for your meal when eating out. Southwest Rapid Rewards Dining is an EASY way to earn Southwest points for free travel! If you happen to eat at a restaurant that partners with the Rapid Rewards Dining program, you earn 3 points per dollar spent at NO ADDITIONAL COST and without even having to say anything to anyone at the restaurant. It’s automatic! It couldn’t be any easier. Even better, your points QUALIFY for the 110,000 Rapid Rewards points you need to earn the Southwest Companion Pass, one of the best deals in travel. The Southwest Companion Pass lets one person fly almost free with you for up to TWO YEARS. 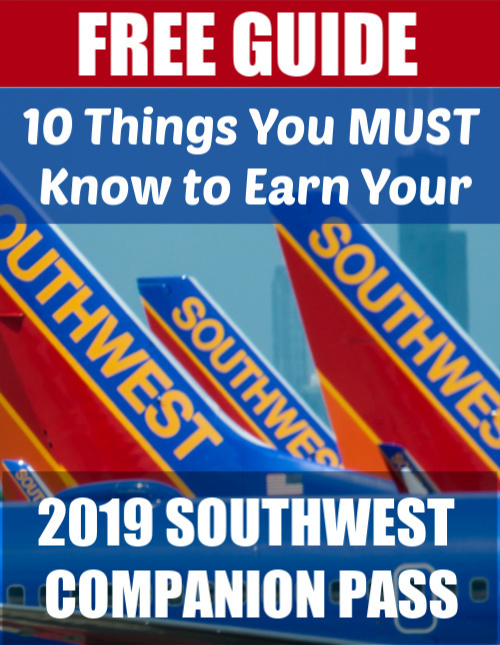 Download my free guide to find out how EASY it is to earn the Southwest Companion Pass and be on your way to free travel on Southwest for both YOU AND A COMPANION. Download Your FREE Guide & Start Flying FREE on Southwest! Success! Now check your email to download your free PDF to get started flying free today! Don't forget to check your spam! Free travel could be at stake :). Make sure you are a Southwest Airlines Rapid Rewards member. It’s free to join, so if you are not, go to Southwest.com and sign up. Visit RapidRewardsDining.com/Bonus.htm and click Join Now to sign up. Enter your information, including your Rapid Rewards number. Add any and all credit or debit cards that you or your family members might use when dining out (it takes about 24 hours for them to register in the system). Then, anytime you use them to pay for a meal at a participating restaurant — whether you know if the restaurant is part of the program or not — you earn 3 points per dollar spent automatically. To earn a full 3 points, you will need to opt-in to their email notifications, otherwise you will only earn 2 points per $1. If you have a debit card, you’ll need to use it like a credit card (ie DON’T enter your pin) or it will not register the transaction. Also, keep in mind if you register these cards with a different airline or hotel dining program, they will no longer work with Rapid Rewards Dining. You’ll have to re-add them and de-activate them in the other account. Points usually appear in your Rapid Rewards account within six to eight weeks of the transaction (and oftentimes sooner!) as registered by the restaurant. Earn a bonus 10 Rapid Rewards points when you review the restaurant where you dined (they’ll send you a reminder email to review the restaurant). Note: BONUS points do NOT qualify for the Southwest Companion Pass but can be used for FREE TRAVEL. Set yourself a reminder every 6 months or so to update the credit cards you have enrolled in the program. That will help ensure you don’t miss out on any free points! 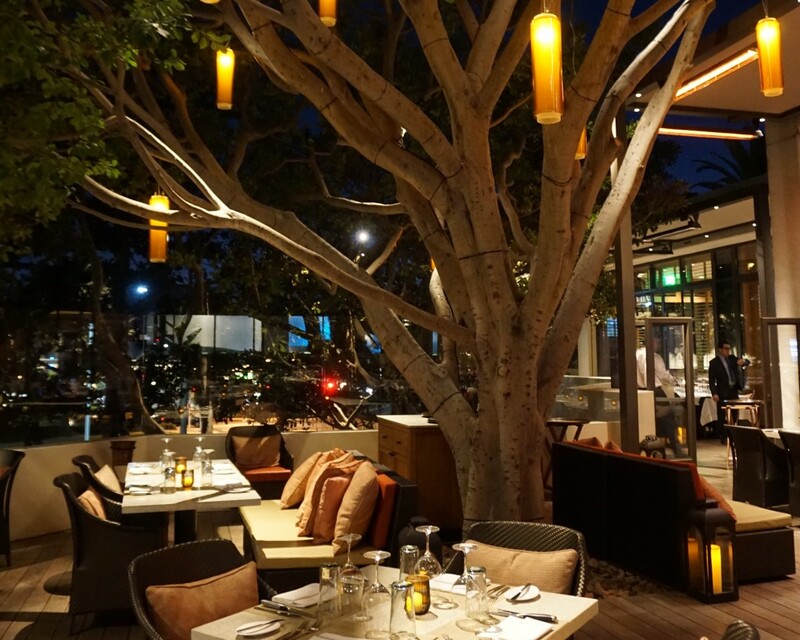 If you don’t have any points from dining within 36 months, your membership will expire. 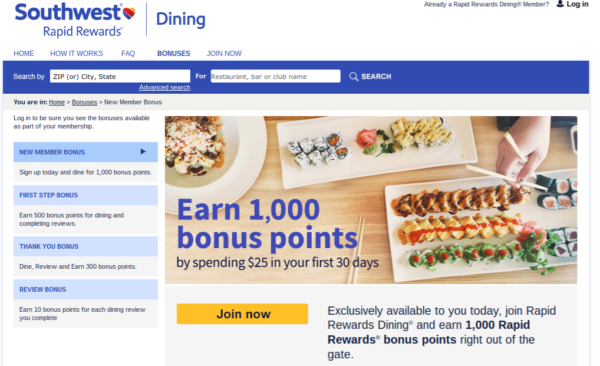 Southwest Rapid Rewards Dining offers 1,000 BONUS Rapid Rewards points to those new to the program. You’ll earn 1,000 points — easy peasy — after spending just $25 at THREE participating restaurants in the first 30 days. You’ll need to spend $25 at each to earn 500 bonus points at the first restaurant and 250 points at both the second and third restaurants. Additionally, you must complete a review of each within 30 days. Note: These points also DO NOT qualify for the Companion Pass. If you pay with a Southwest credit card, you’ll earn an additional point for every dollar spent or if you pay with Chase Sapphire Preferred (my favorite travel credit card), you’ll earn TWO MORE points for every dollar spent (because this card earns 2 points per $1 on dining expenses), which you can then transfer to Southwest Rapid Rewards points. Once you collect 1,500 points, they’ll throw in another 500 bonus points. From that point, every time you earn another 1,000 bonus points, they give you an additional 300 bonus points. Again, these are all bonus points, which DO NOT qualify for the Southwest Companion Pass. Which Restaurants Participate in Southwest Rapid Rewards Dining? Not all restaurants participate in this program, and they tend to be smaller, locally-owned restaurants instead of large chains. You can see which restaurants participate in your area and shop around by searching at the top of RapidRewardsDining.com. You’ll want to be sure to hit one of these restaurants in the first 30 days to earn your 1,000-point bonus. 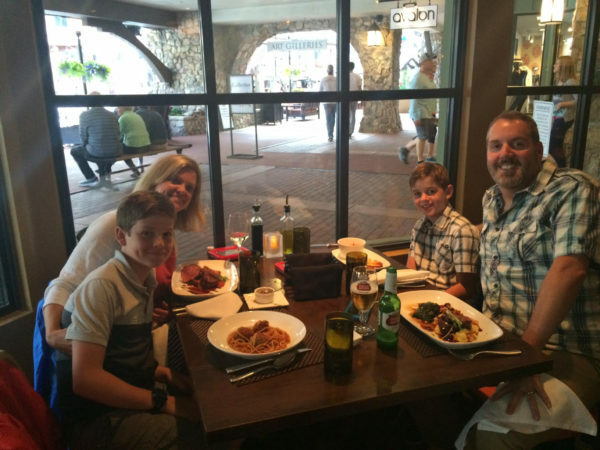 I have been surprised to earn points when dining at restaurants while we are traveling, and you might be, too! It’s a nice surprise. Got questions? To contact Rapid Rewards Dining by phone, call 1-800-771-7579. This is a simple, no-hassle method for building your Southwest Rapid Rewards points balance to get you MORE FREE TRAVEL, so definitely take advantage. It takes a few minutes to set up in the beginning, but it’s well worth it to earn points without ever having to do another thing! Start Flying Free on Southwest with the Companion Pass in 2 Easy Steps! 10 Things You Can Do to Start Flying Free TODAY! Enter your email to get a free PDF that shows you 10 easy things you can do to begin your journey toward flying free RIGHT NOW! You'll also be added to Go to Travel Gal's weekly email newsletter list. I have tried twice to get the bonus after signing up. One time i used the yelp app to place my order for delivery with a listed restaurant and I’m guessing maybe using the app made it not work or qualify. The second time, I ordered directly from the restaurant’s website online for delivery. It’s possible it hasn’t showed up yet in my account, but it’s been a few days. Can you clarify if the only way to earn this is by dining in person at the restaurant (as opposed to ordering on line for delivery?) Thanks! Hi there, I would suggest contacting Southwest’s customer service (bottom of the Southwest.com website) and explaining what you did and requesting they add those points to your account. I am not sure about the effect of using the Yelp app, but so long as you are using a card you have registered with the program — however you pay — you should get your points. I have had to email them about points not being properly applied for car rentals and shopping portal and they have so far honored everything. Where do bonus points appear on your RR account? Do they show RR points and bonus points separately? That’s a good question! I do not see a separate designation for them under your My Account/Recent Activity tab in Rapid Rewards. But you can watch the dial go up and that shows you how close you are to the Companion Pass. Bonus points will not make the dial go up. YOu’ll find that on your main Rapid Rewards page when you log into Southwest.com. Hope that helps. Do these points expire after one year? It’s already end of Nov so I’m wondering. Hi Grace, your Rapid Rewards points never expire if you hold a Southwest credit card. If you don’t, they only expire if you have no Rapid Rewards activity for 24 months. Here’s a post on easy ways to keep your account active. MEET LYN, GO TO TRAVEL GAL! We may receive a commission if you sign up for a credit card. This content and any responses are not provided or commissioned by any companies mentioned. Opinions, reviews, analyses, responses and recommendations are the author’s alone and have not been reviewed, endorsed or approved by any of these entities. It is not the bank advertiser's responsibility to ensure all posts and/or questions are answered.